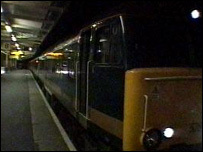 An MP is demanding that Cornwall's night sleeper service be retained or a high speed rail link be set up in its place if the service is scrapped. The Department of Transport has said the train loses £2.5m every year and it is feared it could be scrapped as part of the Great Western franchise renewal. St Ives MP Andrew George claims rail passengers are not getting the service they need. Earlier this year a 3,000-name petition was handed in to Downing Street. Mr George said, "Government Ministers are currently considering whether Cornwall should keep its overnight sleeper service. "The alternative is that the earliest anyone could travel from London to Penzance would achieve an arrival time well after midday in Penzance. "The government must choose. It either gives us a sleeper service or a high speed rail link. It cannot deny us both. "It is not unreasonable to demand that the secretary of state give the people of West Cornwall a round the clock service which other parts of the country simply take for granted."